Private Label-Brands may vary Contains 5mg Ivermectin/ml. 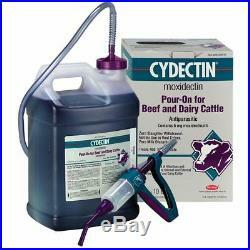 Delivers internal and external parasite control in one convenient low-volume application. Kills: Grubs, Biting Lice, Lungworms, Horn Flies, Sucking Lice, Mange Mites, Round Worms (including Brown Stomach Worms) The dose rate is 1 mL for each 22 lb of body weight. The formulation should be applied along the topline in a narrow strip extending from the withers to the tailhead. Weight Dose 220 lb (100 kg) 10 mL 330 lb (150 kg) 15 mL 440 lb (200 kg) 20 mL 550 lb (250 kg) 25 mL 660 lb (300 kg) 30 mL 770 lb (350 kg) 35 mL 880 lb (400 kg) 40 mL 990 lb (450 kg) 45 mL 1100 lb (500 kg) 50 mL Ivermectin Pour-On has been proved to effectively control infections and to protect cattle from re-infection with Ostertagia ostertagi, Oesophagostomum radiatum, Haemonchus placei, Trichostrongylus axei, Cooperia punctata and Cooperia oncophorafor 14 days after treatment. Ivermectin Pour-On controls horn flies (Haematobia irritans) for up to 28 days after dosing. For best results, Ivermectin Pour-On should be part of a parasite control program for both internal and external parasites based on the epidemiology of these parasites. Consult a veterinarian or an entomologist for the most effective timing of applications. When To Treat Cattle With Grubs Ivermectin Pour-On effectively controls all stages of cattle grubs. However, proper timing of treatment is important. For the most effective results, cattle should be treated as soon as possible after the end of the heel fly (warble fly) season. While this is not peculiar to ivermectin, destruction of Hypoderma larvae (cattle grubs) at the period when these grubs are in vital areas may cause undesirable host-parasite reactions. KillingHypoderma lineatum when it is in the esophageal tissues may cause bloat: killing H. Bovis when it is in the vertebral canal may cause staggering or paralysis. Cattle should be treated either before or after these stages of grub development. Cattle treated with Ivermectin Pour-On at the end of the fly season may be re-treated with ivermectin during the winter without danger of grub-related reactions. For further information and advice on a planned parasite control program, consult your veterinarian. Do not use in female dairy cattle of breeding age or calves to be processed for veal. 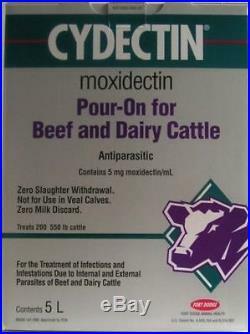 The item “IVERMECTIN Pour On 2 x 5 Liters Cattle Calf Wormer Parasites Ivermax Lice Mange” is in sale since Friday, July 6, 2018. This item is in the category “Business & Industrial\Agriculture & Forestry\Livestock Supplies\Beef Cattle”. The seller is “petsandvet” and is located in Hawarden, Iowa. This item can be shipped to United States. Private Label-Brands may vary Contains 5mg Ivermectin/ml. Delivers internal and external parasite control in one convenient low-volume application. Kills: Grubs, Biting Lice, Lungworms, Horn Flies, Sucking Lice, Mange Mites, Round Worms (including Brown Stomach Worms) The dose rate is 1 mL for each 22 lb of body weight. The formulation should be applied along the topline in a narrow strip extending from the withers to the tailhead. Weight Dose 220 lb (100 kg) 10 mL 330 lb (150 kg) 15 mL 440 lb (200 kg) 20 mL 550 lb (250 kg) 25 mL 660 lb (300 kg) 30 mL 770 lb (350 kg) 35 mL 880 lb (400 kg) 40 mL 990 lb (450 kg) 45 mL 1100 lb (500 kg) 50 mL Ivermectin Pour-On has been proved to effectively control infections and to protect cattle from re-infection with Ostertagia ostertagi, Oesophagostomum radiatum, Haemonchus placei, Trichostrongylus axei, Cooperia punctata and Cooperia oncophorafor 14 days after treatment. Ivermectin Pour-On controls horn flies (Haematobia irritans) for up to 28 days after dosing. For best results, Ivermectin Pour-On should be part of a parasite control program for both internal and external parasites based on the epidemiology of these parasites. Consult a veterinarian or an entomologist for the most effective timing of applications. When To Treat Cattle With Grubs Ivermectin Pour-On effectively controls all stages of cattle grubs. However, proper timing of treatment is important. For the most effective results, cattle should be treated as soon as possible after the end of the heel fly (warble fly) season. While this is not peculiar to ivermectin, destruction of Hypoderma larvae (cattle grubs) at the period when these grubs are in vital areas may cause undesirable host-parasite reactions. KillingHypoderma lineatum when it is in the esophageal tissues may cause bloat: killing H. Bovis when it is in the vertebral canal may cause staggering or paralysis. Cattle should be treated either before or after these stages of grub development. Cattle treated with Ivermectin Pour-On at the end of the fly season may be re-treated with ivermectin during the winter without danger of grub-related reactions. For further information and advice on a planned parasite control program, consult your veterinarian. Do not use in female dairy cattle of breeding age or calves to be processed for veal. 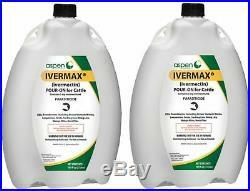 The item “IVERMECTIN Pour On 2 x 5 Liters Cattle Calf Wormer Parasites Ivermax Lice Mange” is in sale since Tuesday, January 9, 2018. This item is in the category “Business & Industrial\Agriculture & Forestry\Livestock Supplies\Cattle – Beef”. The seller is “petsandvet” and is located in Hawarden, Iowa. This item can be shipped to United States.